Status: Contest finished on 07-12-2009. New remix contest by Trackitdown and Oldskoolmp3. 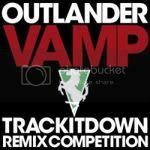 Remix the classic “Vamp” by Outlander and win a R&S Records release and £100 worth of sample packs. Get ready!